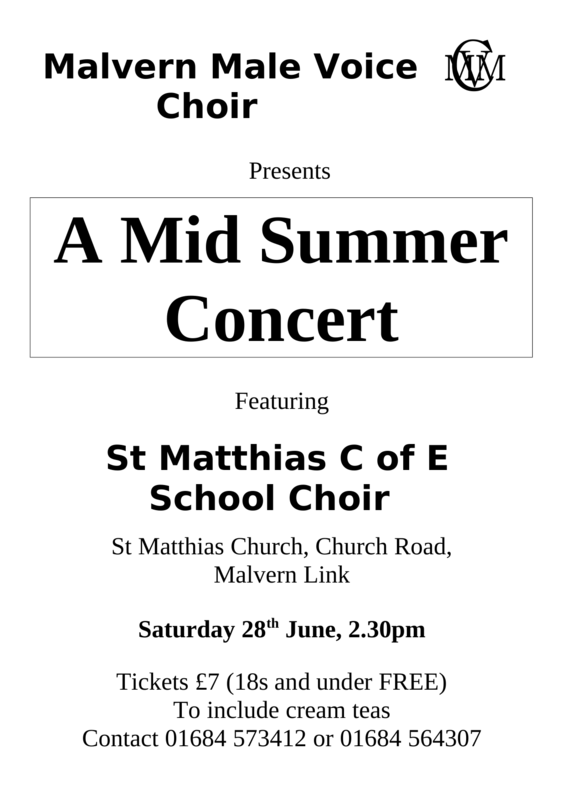 Malvern Male Voice Choir will be singing on Saturday the 28th June at St Matthias Church, Church Road, Malvern Link, in a joint concert with St Matthias Church of England School Choir. A celebration of midsummer is promised as the two choirs perform an enjoyable and uplifting set of songs. The varied selection of songs from both choirs includes an opportunity for audience participation and there will be tea and cakes after the concert. The Midsummer Concert at St Matthias, Church Road, Malvern Link, starts at 2.30pm. Tickets, which cost £7 (18’s and Under Free) and include the refreshments, can be purchased in advance from Martin Wheeler on 01684 573412 or Sally Brittain on 01684 564307. Any remaining can be purchased on the door.